‘I’m calling a taxi and I’m going home’, said my son, 14. ‘Why not?’ said my son. ‘Because we’re in the departure lounge and there’s no way that you can get out’, I explained. We were at London Gatwick airport, and we’d just found out that our flight to Italy had been cancelled because of fog. Our family of four was travelling with two friends, and we were going to spend the weekend in the mountains with some friends in Piedmont. Only, at that point, we weren’t sure whether or not we were going to make it there. There followed a very confusing time when we tried to work out what to do – none of us had experienced a flight cancellation from inside the departure lounge before and we didn’t know how to get out of there, where to collect our bags from, how to get on to another flight or what our passenger rights were. We eventually managed to book another flight for the following morning, our airline booked us an overnight airport hotel and we collected our bags, escaped from the airport, and made our way there. The next morning we flew to Italy. 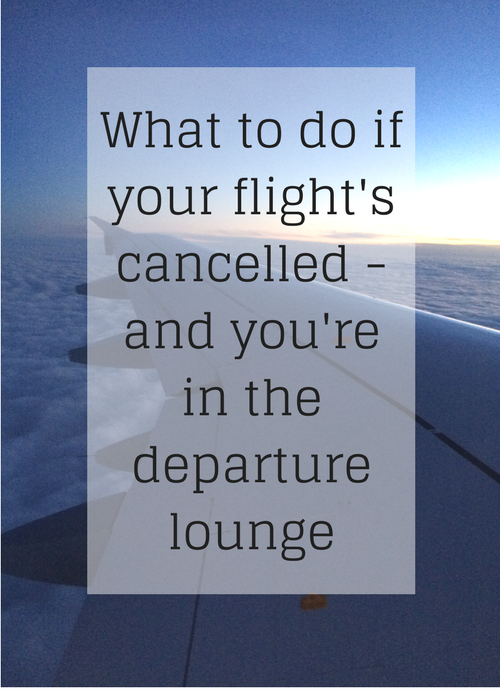 Hopefully you’ll never have a flight cancelled when you’re in the departure lounge but, just in case you do, these tips should help you. If you still want to travel, focus your attention on booking another flight asap – most of your fellow passengers will be trying to do the same, so you need to get in quick before the seats are all gone. If you booked your flight online, make sure that you know your login details so that you can try to get on another flight asap. I’d booked our flights on my laptop and didn’t know my login details or have them on my phone, and so it took us longer than it should have done to rebook our flights. If you can’t get online, then you’ll have to queue up with everyone else at the airline information desk – it’s likely to be a very long queue. If you’ve bought any Duty Free items, you’ll have to return them and get a refund before you go out of the departure lounge, because you’re not travelling out of the country. Annoying, isn’t it? Listen for announcements and keep an eye on the information boards – you will be told to go to a gate in order to go out through passport control and to the baggage hall to collect any luggage which you’ve checked in. Once you have your luggage, go out through Customs to the arrivals hall, as if you’ve arrived from your flight. From there, if you need help with flights, or if you need accommodation while you wait for your later flight, you need to find your airline’s information desk. It’s probably in the airline’s check-in area. Keep receipts for any food or drink that you buy or any accommodation that you pay for as a result of your cancelled flight – you should be able to claim these costs back from your airline (see below for details of your passenger rights). At the moment, if you’re travelling in the EU you are protected by the best passenger rights in the world – obviously I have no idea if or how these rights will change after Brexit. But, right now, if your flight is cancelled, you’re entitled to reimbursement, re-routing or return, as well as assistance and compensation. You can find out about this on the official EU website. Has this ever happened to you? Do you have any tips to add, or is there anything which you’d like to ask me about our experience? I really felt for you at the time. This is excellent advice to file away for all travellers I think. Thank you Sarah – it was stressful, but it wasn’t the end of the world. Some people were really distressed about the cancellations. Useful info, everyone’s worst nightmare! I know – it was very confusing! Really good advice. I never remember my log in details. Admittedly this has never happened to me once in the departure lounge only before I’ve checked in. What a nightmare though! It was pretty stressful – but at least if it ever happens to me again I kind of know what I need to do! Very useful to know – must have been awful at the time! 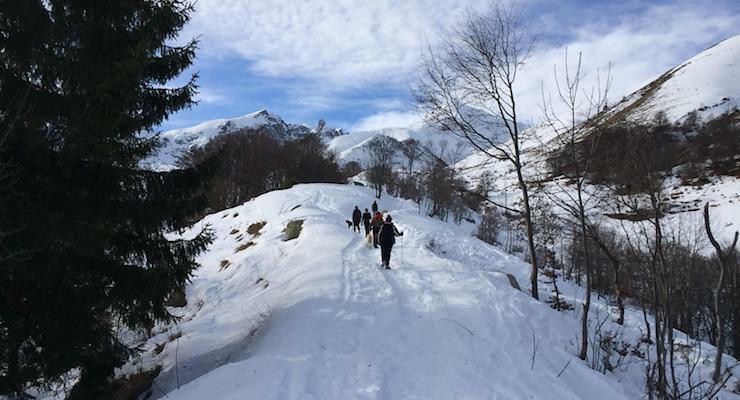 It wasn’t my favourite travel experience – but it all worked out OK in the end!